BG gets its rematch against Miami today. As detailed in yesterday's post, this is a huge game. BG continues to have a legit shot at getting one of the 4 byes--a significant accomplishment given the expectations for this year. But, this one is very worrisome. Yes, Miami is a lower-ranked team in our conference. However, they have now won 4 in a row--the last 3 over Akron, Kent and BG--and it appears that the John Cooper program might be kicking in down there. This is a dangerous time to be playing them and a dangerous time to be playing them in Oxford. Miami is now 7-8 in MAC play. Furthermore, the game at BG was not especially close by the end. The Falcons need to bring a significant effort out there to get this game won. Miami put a lot of pressure on BG and switched defenses a lot. There was full court pressure and half court trap. BG was driven right out of its offense and struggled to make shots, especially in the 2nd half when BG shot 32%, missed all 11 3FGs and scored 23 points. BG has had an extra day to look at this and they are going to have to get something figured out. Coach Jans is a good Coach and I think he will prepare his team to handle what Miami will want to do. The other thing Miami did effectively was create dribble penetration. Late in the game, they would run the clock down and then Eric Washington would drive into the key, without benefit of a screen. Obviously that's a killer when you are trying to catch up. Miami beat BG on both ends of the floor. Miami scored 1.08 points per possession and BG scored .9. Miami shot 42% and 33%...though they tried only 9 3FGs. BG shot 36% and 23%. 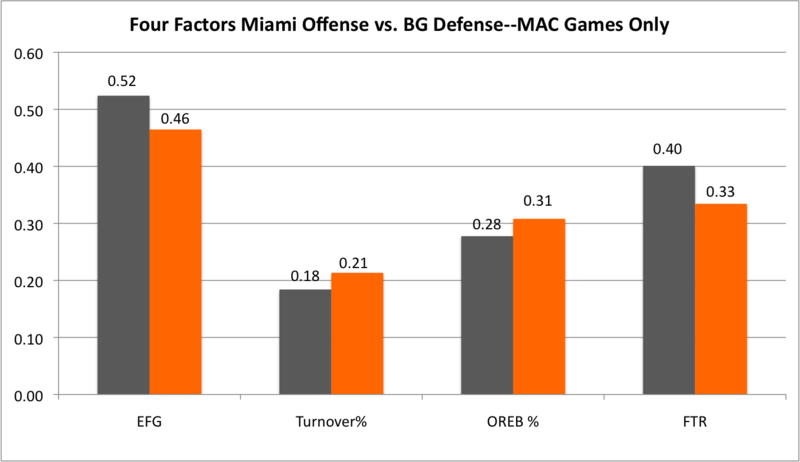 The other stats were pretty even, and FTAs were the same both ways, but Miami made 20 out of 21 and BG made 14 out of 20. This was a game where BG had trouble getting anyone going except Richaun Holmes. He had 21 points, 7 of 9 shooting, 12 rebounds and 5 blocks. As we noted, the rest of BG's team shot 11 of 41 and 3 of 22 shooting. For Miami, the leading scorer was Australian Jaryd Eustace, who had 14 points in 11 freaking minutes. Geovanie McKnight, who had an inefficient 13 on 4 of 14 shooting and 10 rebounds. Will Sullivan had 11 points on 6 of 6 FT shooting and 6 rebounds. Eric Washington looked like a player late, but he was 2 of 9 shooting with 4 assists over 5 turnovers. The last time BG competed at this level was 2009, when BG finished with a regular season title. That was the year the Falcons wrenched a win out at the JAR to set the whole thing in motion. The next 3 are big, starting with this one. It's going to be a test. First, it is a tough schedule. Coach Babers said somewhere--in a way only he can--that you know you have to walk home from school and these guys are waiting for you, but you still gotta do it. There are no breaks in the non-conference schedule. You have Tennessee, Maryland (both "away"), a tough Memphis team at the Doyt and then @Purdue, where we are undefeated! Anyway, four very tough games to open the slate. There are no FCS games on our schedule, which we knew. In the MAC, BG has the same cross-over games...UT, WMU and Ball State. Two of those are away this year, with UT as the last home game and Senior Night. Also, BG finishes with all MAC West games again. In terms of home games, I'd say people will not be thrilled. First, we play only 5 home dates. Second, only 3 Saturdays. To me that's the big one, but what can you do? That ship has long since sailed. Memphis and Toledo are good opponents, Ohio is a traditional review, Akron might be decent and UMass is...UMass. BG does not play Miami again this year. So, that's the deal. Mark your calendars now! BG will really be tested this year...and with all the normal anxieties we have, especially on defense, we are going to have no place to hide. MAC Standings, 3 games left! So, things begin to shake out a little more, but still a lot of work to do. That UT loss on Wednesday was really tough. That's at home to a team they really should beat. They have only one home game left now. For BG, they are in 3rd right now. For whatever it is worth, they have clinched home court. Tough road ahead, though. BG has a hot Miami team on the road, Kent at home and then a hot Buffalo team on the road. They have a two-game lead on Akron and WMU and a one-game lead on Buffalo. Head to head BG wouldn't beat Akron but would beat WMU in tie-breaker, but the most likely possibility is a multi-way tie. So, obviously, if BG wins out they get a bye. With 2 wins, they could finish no worse than 5th, and if BG had 2 wins and one of them was @Buffalo, they would clinch a bye. With two wins and a loss to Buffalo it gets a little more complicated but a tiebreaker results with Toledo and Buffalo in it, and that's not great for BG. BG could get a bye with one win, but that gets really tough to decipher at this point, based on how other teams do. So, here's your rooting interest right now for Saturday. To begin with, the BG-Miami game is huge. This is the most likely win left on the schedule and the Falcons need it very badly. This is one of the bigger games in years for this program. First, it depends on what you are shooting for. Here, we are shooting for one of the four byes and therefore are rooting for Kent to beat Buffalo. If Buffalo wins, it is not the end of the world, because Kent could easily lose all 3 going home and one of those games is with BG and that would probably end up with BG getting a bye. We are also rooting for Ohio over Akron and EMU over WMU, although in both cases that means rooting for road underdogs. Toledo should beat Ball at Savage...but then again...and CMU is @NIU, again, very winnable, but who knows. So, football break-in quickly here, with an extra day between men's basketball games. First, Spring practice is right around the corner, as you can see above. The Spring game will be on April 11--bundle up. Monti Phillips: Monti was a walk-on who got some reps against Wisconsin and was called out by Coach Babers as someone who was making an impact from off the depth chart. He did not do much from there, playing 9 games with 7 tackles. No longer on the roster. Brandon English: You may remember that when Clawson realized he would probably lose Anthon Samuel, he brought in 4 Florida RBs in one class. Fred Coppet emerged as the best of the four. Eric Harrell and Marcus Levy both left without making much contribution and Brandon English--who greyshirted--was the other still left. He carried the ball 3 times last season. John Klingerman: He was a highly productive HS player who made a bunch of catches in last year's spring game. He was actually on an early two-deep but made only 2 receptions on the season. Also, of course, Jhalid Croley was dismissed for alleged legal issues. Anyway, the good news is that this does not represent major off-season attrition, especially with a new Coach. Finally, the schedule will be out at 3 pm on Friday, so we will know the dates--and maybe a couple of the times--for the year. I think Coach Jans said it best when he said "he was as curious as anyone" about how his team would respond to last week's losses and being under pressure to win. What he saw had to please him. BG dominated OU at the Convo, leading by as much as 23 and winning by 11 in the final analysis after a late run by the Bobcats. Let's get all the disclaimers out there. OU is having a rough year. (Turns out Jim Christian might be smarter than we thought). Not only are they struggling, but their best player, Bean Willis, played only 9 minutes due to an in-game injury. BG was set up for success. The point is that they delivered on it. When you have a bad team like OU, you are supposed to drub them, and the Falcons more or less did. With 12 minutes left, OU led 14-13. From there to the end of the half, BG had a 27-8 run to head into the half with a 40-22 lead. BG led by as much as 23 in the 2nd half. OU went on a run late (this time with most of BG's starters in the game) and brought the lead down to 9 with :40 left, but were never in a serious position to get back into the game, though that might have been different if a couple of late 3s had fallen. So how did that happen? Well, BG shot better overall (45%) while still struggling from the 3FG. (24%). From the quotes after the game, it sounds like BG's priorities were to rebound and to get the ball in the paint--and shoot fewer 3FGs. So BG had OK shooting, took very good care of the ball while doing an outstanding job on the boards. BG got 47% of its available offensive boards--its best game of the season--and held OU to 28%, which is also a good result. Meanwhile, BG had one more foul than OU, but BG shot 17 FTs and OU shot 8, a sign that BG was getting the ball inside, per the game plan. BG also made 14 of 17 FTs, their third best FT% of the season. The other big news was that BG succeeded on someone's else game than Richaun Holmes. Holmes struggled--though he did keep his double-figure scoring streak alive--scoring only 11 points on 3 of 12 shooting. He added 8 rebounds. Spencer Parker was the lead guy picking him up, with 19 points on 7 of 14 shooting and 3 of 6 on 3FG, along with 10 rebounds. Jehvon Clarke scored 13 on 6 of 13 shooting and Henderson had 10 on 5 of 9 shooting. Coach Jans shook the lineup up a little, starting Parker for Dickerson and Clarke for Denny, who is in a big slump as his first season as a D1 player seems to be wearing on him. BG got minutes out of Josh Gomez--6 points and 3 rebounds in 10 minutes. He could be very valuable to BG even in that role moving forward. Delvin Dickerson played only 8 minutes. Finally, the PG split has slowly moved to Joseph, who played 27 minutes to 9 for Austin. So, BG now moves on to play Miami in Oxford on Saturday. Miami beat BG and is playing really well. They have won 4 straight, the last 3 against BG, Akron and Kent. 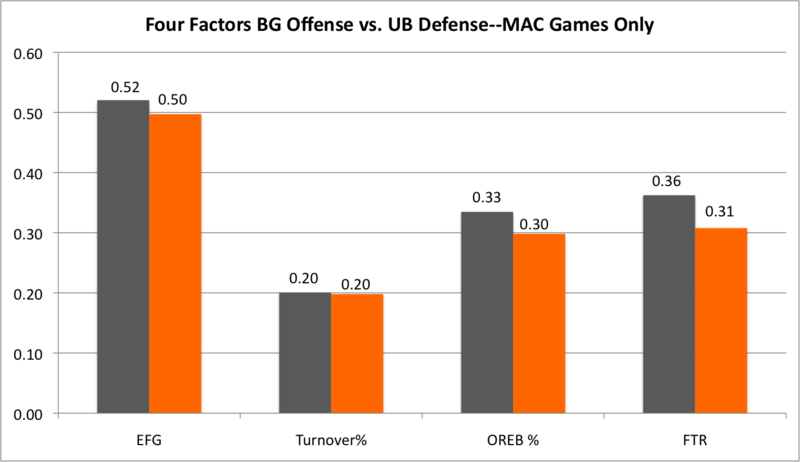 They pressured BG and also had success with dribble penetration against BG in the first game, and it will be critical to see how BG responds to those challenges at Millett. So, with its back to the wall, the BG Falcons head to Athens with words like "over-achieving" following them the whole way. BG has lost 2 in a row at home but won 2 road games the week before that, so maybe bizarro world mojo will set in. Early in the MAC season BG played OU at the Stroh and the Falcons won by 15. OU is not having an OU-season. They are 9-16 and 4-10. They are 3-4 at home in MAC play, with wins over Buffalo, Akron and EMU at the Convo, while losing to UT, CMU, Kent and NIU at home...so really one one bad home loss. Their only MAC road win is @Ball State. They are also on a 4-game losing streak. The first time the two teams played, it was a perfect storm. BG scored 1.13 PPP and held OU to .89 points per possession. 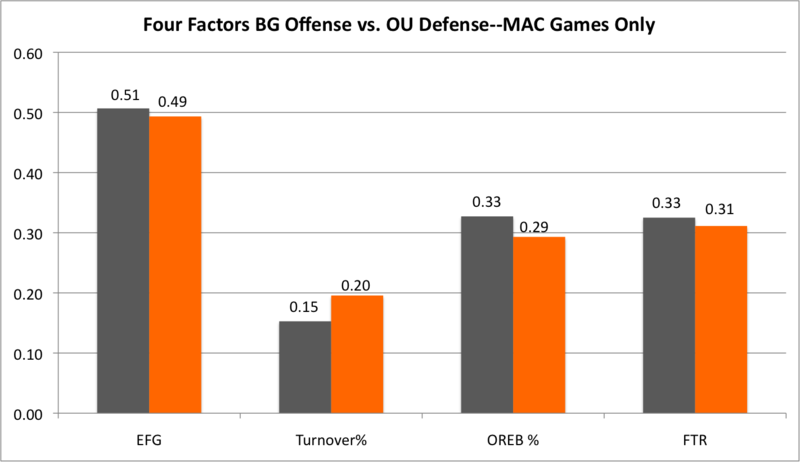 BG shot well (44%/38%) and held OU to poor shooting (33% and 36%), while protecting its own defensive boards and keeping OU off the FT line to get the win. Holmes double-doubled at 18 and 12, Denny had 11 and 9 and Anthony Henderson scored 10. Ryan Taylor had 16 for OU and BG did a nice job against Ndour, who shot 4 for 10 but had 9 rebounds. The following stats are all MAC games only. OU is where they are in the standings because they are 11th in offensive and defensive efficiency. 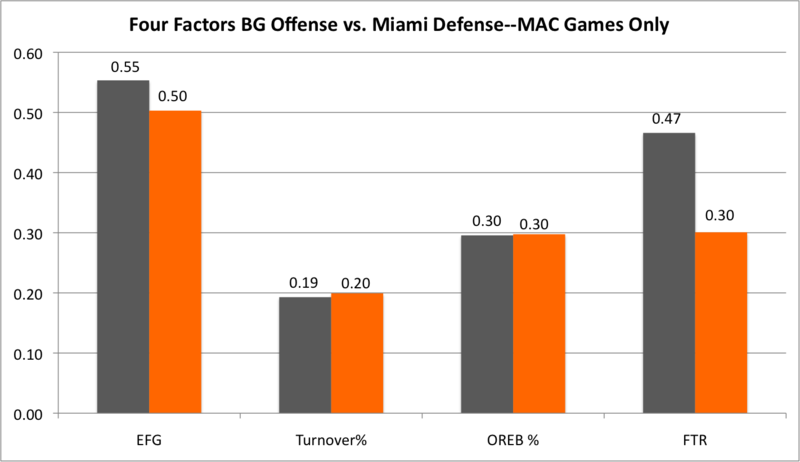 Prior to the last two games, BG was typically shutting down good offensive teams and scoring on the other end, a trend that was reversed against Miami and Buffalo. BG needs to play good defense and lock down a poor defensive team...and then take advantage of an ineffective defense. Sort of like the formula from the first game, except we're hoping to just win by 1. Here's how that battle matches up. 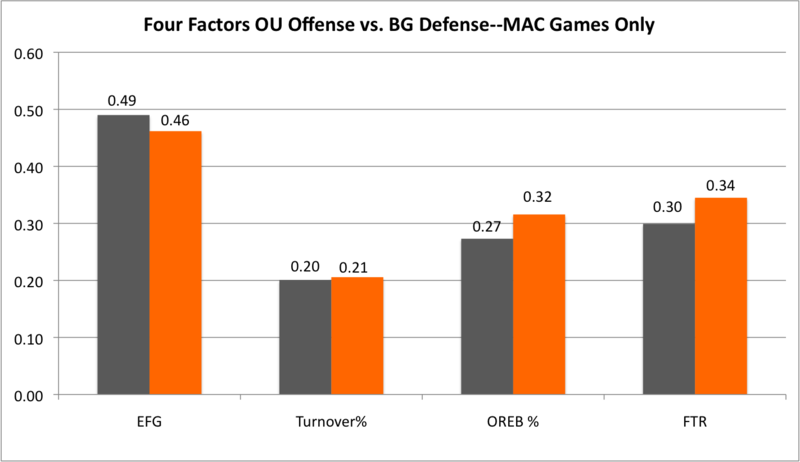 OU is a poor shooting team with below average turnovers, way below average offensive rebounding and FT shooting. This is a good matchup, albeit on the Convo floor and BG needs to assert itself. Having said that, if BG does not play better offense there is no way to play good enough defense to win. OU is poor defending the shot, doesn't force turnovers and is ineffective on the defensive boards. BG simply has to get people other than Richaun Holmes making shots....or they have to feed the post on every possession. This is also a good matchup for the Falcons and they need to deliver on it. They are led by Maurice Ndour and Bean Willis. Ndour is scoring 14 a game on 49% shooting and is 2nd in the MAC with 8.4 rebounds per game. He also block 2.4 shots per game. Willis is a PG and scoring 14.1 per game. He is not efficient--he shoots 40% and 36%. He's also only getting 2.9 assists against 2.8 turnovers, so he has struggled in MAC play. Antonio Campbell is scoring 10.6 PPG on 47% shooting and 7 rebounds a game. BG really needs a win. OU has been capable at home and on a losing streak. This one has got me very nervous. BG has been pretty resilient and this will be big test for that. The most important thing BG can do that they have not been doing is make a few shots. First, Akron is at Buffalo in a very big game. Akron is struggling to stay in the first tier and Buffalo is hot and I believe a pretty dangerous team. Further, Akron PG Noah Robotham tore his ACL against Miami on Saturday and that would put him out for the year. This is a big game and would be a great one to see. Beyond that, of the first 3 teams, all 3 have winnable games. UT is at home against NIU and Kent is @ Miami and CMU is @EMU. Miami has played well a couple games in a row, so that one has the potential to be interesting and CMU taking on the EMU defense could be interesting. Best odds are that all 3 of those teams win. WMU is @Ball State, a game they should win as well and BG is @OU badly needing a win in a tough place to play--though against a team they handled earlier this season. Right now, BG has tiebreaker issues with Akron and Buffalo--the two teams behind them--so staying in front of them is key. Things are just a little different this morning. BG has its back to the wall for the first time this year. Coming into the week, things could not have looked better. BG had a 1-game lead in the MAC, with two winnable home games up coming, two winnable road games the week after that...BG seemed to have gotten itself into a really solid position. One week later, it is all gone. BG lost both of those games at home--something you simply cannot do in the home stretch of the conference season. Now, BG is one game back of the lead with Buffalo running up behind them and faces two road games that it simply has to have. BG now faces the possibility that it might have a first round game before getting to Cleveland. Who knows? As unexpected as this week was, maybe next week can be the same. The Falcons are in a shooting slump and when I say that, I say that everyone except Richaun Holmes is in a shooting slump. Holmes is playing great. No one else is consistently producing. Not counting Holmes, BG is 24 of 81 shooting over the last two games, that's 29%. BG is equally bad from beyond the arc. Not counting Holmes in the Miami game and Dickerson in the Buffalo game--two guys who should not be your 3FG leaders--BG is 4 of 37 on treys. You just can't play good enough defense to win with that. Not that BG was playing great defense Saturday either. BG played their third worst defensive game of the season, (USF and Ferris were worse) and the second worst rebounding game of the year. The die was cast in the first half...which Coach Jans called a "disaster." The game was tied at 7 with 12 left in the first half. Over the next 9 minutes the Bulls just shredded BG for a 27-10 run...that's 3 points a minute against 1 point a minute. They did it with uncharacteristic 3FG shooting compared with offensive rebounding and a complete inability of BG to score baskets. The lead at that point was 17 and BG had it to 14 by the half. The Falcons did battle back, though it did not happen right away. With 12 left in the game BG was still down 11. Over the next 5 minutes, BG went on a 16-4 run to actually take the lead for 42 seconds. As you often see, BG expended itself getting back in the game and was not prepared to grind it for 7 more minutes. The lead was 5 with 4 minutes left and moving in the wrong direction. Henderson missed a FT that could have cut it to 3 and Buffalo came down and drilled a 3 that made it 7 with 3:28 left and from there it was fouls and free throws ending in a Buffalo win...68-56. Ultimately, Richaun Holmes made the point after the game...it was tough to battle out of the hole BG was in but the Falcons put themselves into that hole. We have already discussed the overall stats. 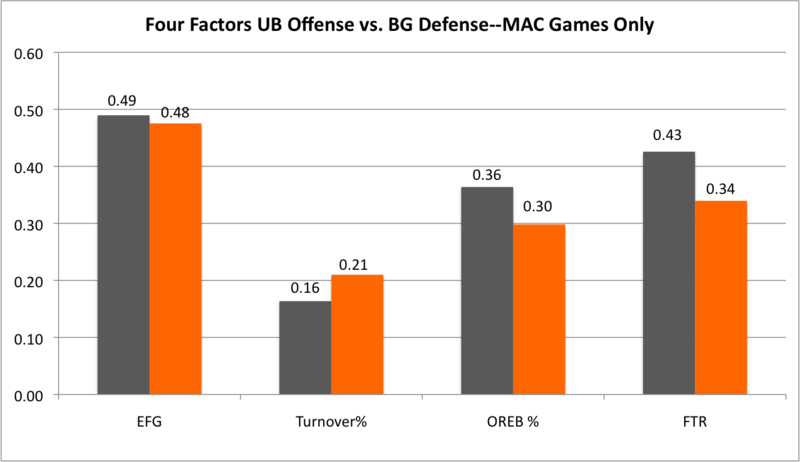 BG actually did a decent job on UB's strength--which is the 2FG--holding the Bulls to 28% on that front. However, Buffalo shot 53% from beyond the arc, dominated the glass, got to the FT a lot and shot 83% when they were there. Meanwhile, BG had .95 points per possession on 40% and 20% shooting, low turnovers (which saved the line with shooting like that) and 67% FT shooting. On an individual basis, Richaun Holmes continues to play at a very high level. He had 15 points on 7 of 10 shooting, 7 rebounds and 5 blocked shots. As noted above, the issue is getting production from other guys...and maybe getting him the ball more often. Clarke had 12 points--but on 4 of 11 shooting--and a team high 8 rebounds. Spencer Parker had 11 points on 3 of 5 shooting and Delvin Dickerson scored 10--including 3 of BG's 4 3FGs--in only 15 minutes of action. And so it goes. BG has lost 2 in a row for the first time this year and now has its back to the wall. Three of the final 4 are away and the home game is to Kent. This is a tough part of any season...it is a real grind at this point. It will be interesting to see how BG can recover and it will be a good test for the program. Buffalo is an interesting case. They are 7-6 in the MAC and 16-9 overall but with the best RPI in the MAC. They had no bad non-conference losses--the worst is to #130 St. Bonaventure and there are losses to Wisconsin and Kentucky in there, too. Their highest quality non-conference win was over #103 South Dakota State and they had 6 wins over teams with a 200+ RPI. Even though they lost a ton of talent in the off-season, their conference struggles have been a little bit surprising to me. When you look at it, they have beaten the weaker teams (Miami twice, NIU, @Ball State, @EMU) and then added in wins against WMU and Kent, both at home. They have lost to CMU twice, Akron and Toledo (the top teams in the MAC) along with OU and WMU. They are 3-4 on the road in conference with wins over Miami, EMU and Ball State. If they beat BG, it will be their biggest MAC road win of the year. UB is the #2 offensive team in the MAC...which means that the game will be what most of the BG games are, which is a battle between one of the top offenses in the MAC and the top defense. On the other side, BG needs to get it mojo back after a very poor offensive game against Miami. Buffalo is just average defensively, and BG will need to hit shots to take the pressure off the defensive side of the court. UB is not a great shooting team. In fact, the effective FG% you see below is 10th in the MAC. They are 3rd in overall FG% (44.8%) but last in 3FG% (27%). They build their offense on that solid 2FG shooting, taking great care of the ball, MAC-leading offensive rebounding and good success getting to the line. They are 3rd in FT shooting as well. This is the rare successful offensive team that is built on something other than shooting. Flipping things around, UB is not great at defending the shot. They do force decent turnovers, are not great on their own boards and they do get teams to the FT line a little bit, but not as much as they get to the line. BG needs to make shot at this level and take better care of the ball. I will be interested to see if UB pressures BG, which has been a winning strategy for others. Individually, the Bulls are led by Justin Moss, who is from Romulus, MI and took a pretty remarkable journey to end up in Buffalo. He's a really good player...a 6'7" Junior who scores 20.5 PPG and gets 8.7 RPG, (MAC games only) and those are both #1 in the MAC. The scoring is #22 in DI. He's shooting 58%, leads the MAC in free throws and free throws attempted...he has 19 straight double figure games and 11 double-doubles this year...he's a likely leader for being MAC Player of the Year. Shannon Evans is the second leading scorer at 14.2 PPG, shooting 41% and 27% with 3.5 assists per game, which isn't terribly efficient. Xavier Ford is scoring 11 PPG on 53% shooting and 6.1 RPG. LaMonte Bearden leads the team with 4.3 assists per game. OK, so what is the final analysis here? First, BG has played really well off a loss and it would be great to see the same thing today. I actually think BG will rally with a much stronger game at home. The inside game between Holmes and Moss will be very interesting, but the key for BG is to get its guards to make some shots. BG remains in the hunt for the high seeding but you can't lose 2 in a row at home this late in the year and expect that to happen. Big game. At QB, he compares Johnson, Knapke, Callaway and Nicholas to "the exact same situation as a school down to the south", ie OSU. No really. Read it for yourself. Then resume your normal activities. Spring ball starts March 17. Five games left, and you see where things stand. BG is 9-4 in a four way tie for first with Kent, Toledo and CMU. With a 2-1 record in the tie-breaker, BG is 2nd at this point. Five games are left. For whatever it is worth, BG holds a four game lead over the teams who (Miami and EMU) currently hold the last home berth. Let's hope we don't get there, but I was the guy who was figuring out how the football team could in the East with 3 losses when that seemed unlikely to many people. In games tomorrow, Toledo and Kent are both away--@WMU and @OU, respectively. Kent should have an easier time and UT should be favored but with a tougher game. CMU is home with last-place with Ball State and should hold serve, while BG has Buffalo at home...the Bulls remain dangerous and BG played poorly Wednesday. Akron--one game back--hosts Miami and should win, and EMU and NIU play in a game with few ramifications for playoffs. That one, I fear, is going to leave a mark. The Falcons came into the game against Miami last night--a game they really needed to win against a team with no quality MAC wins, 1 road win, etc. And Miami simply outplayed BG and beat BG on the Stroh Center floor. The other teams with home games in the MAC held serve, UT got a huge road win at the JAR and now there's a four-way tie at the top of the MAC, with BG provisionally in 2nd right now, helped immensely by having Akron in 5th and not in the tie breaker right now. It was a disappointing night. Miami played really hard and had a great game plan. They pressured BG all night and the Falcons never got into an offensive rhythm. Sometimes the pressure was full-court and sometimes it was a half-court trap...BG didn't handle either one very well and by the time they got into their offense it just seemed like they couldn't generate any kind of shot. When there was a shot, it didn't go down. I'm really happy with the season we are having and the team is better on almost all fronts, but this team does not handle pressure very well and we don't seem to be getting any better at it, even compared to last year. The other issue was half court defense. BG played good defense from time to time, but late in the game, Miami would run the shot clock down and then Eric Washington would isolate up top and without benefit of a screen get by his defender and into the lane. The key phase of the game came in the second half. BG was up 4 with 13 minutes left and Miami went on an 11-0 run in 2:06 and led the rest of the way. BG had it within 3, missed a shot in transition off a steal and then on the next possession missed two shots at the hoop before Miami got a basket and soon enough the score was +7. BG did not make a serious run late. Miami didn't shoot great (42% and 33%), but they shot better than BG, which shot 36% and 23%, which includes no made 3FGs in the 2nd half. Miami supplemented that by shooting 20 of 21 from the line, and all else being essentially equal that was the difference. Individually, it is not possible for Richaun Holmes to be more productive than he was. He had 21 points on 7 of 9 shooting, 12 rebounds 5 blocks and 2 steals. The remainder of the team shot 11 of 41. Holmes was 3 of 4 from 3FG....the remainder of the team was 3 of 22. There's no reason to delve into that, it is a team failure. BG returns to the Stroh riding a high....a 4-way winning streak, a road win in Muncie and now stand in first place in the Mid-American conference with 6 games left to play. 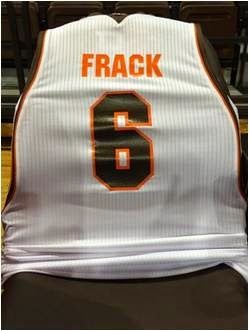 This has been a surprising and wonderful season and now one of BG's traditional rivals comes into the Stroh. Let's keep our fingers crossed...it would be fantastic to see a big crowd for the game and get the team the support they have earned with a 9-3 conference record. Miami is on a rebuilding project. They were pretty low when Coles left and it has been a long road for a team that is a traditional power in the MAC. They are 9-16 overall and 4-8 in the MAC with an RPI of 289. Furthermore, they don't really have a quality MAC win. They have beaten Ball State, OU and EMU at Millett and won @NIU. They also lost at home to NIU. Five of their last 6 games are against Akron, Kent or BG...they are 1-8 on the road overall and 1-5 in MAC play. Coach Cooper came in to replace Coles and immediately picked the tempo up, running at 66 possessions per game (all stats MAC games only) which is faster though right in the middle of the conference. 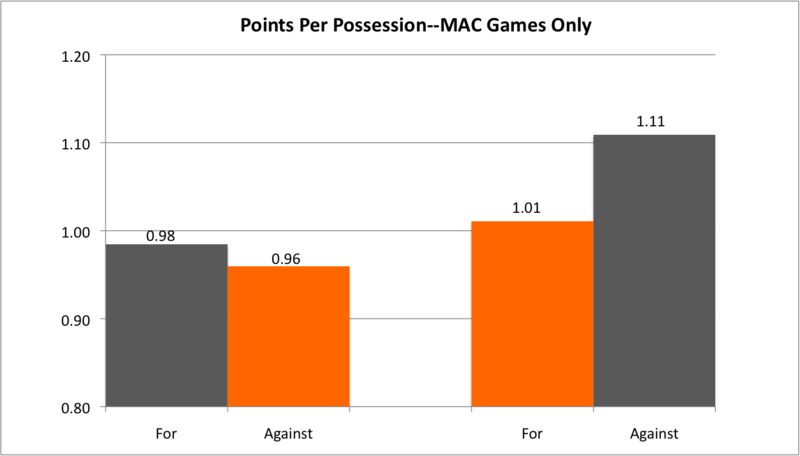 The chart below explains the issue...they score 1.05 points per possession, which is 5th in the MAC...and they allow 1.12 which is the worst in the MAC and 315th in D-I. Meanwhile, BG's defense is #1 in the MAC and #33 in D-I. BG has consistently been able to shut good offensive teams down of late, and with a weak defensive performance Saturday fresh in their heads, I like the way this match up shapes up for BG. Miami is a decent offensive team. They shoot 46% overall from the field which is 2nd in the MAC. Now, that's a very heavy mix of 2FGs. They are 10th in the MAC in 3FG attempts. That leaves them 3rd in EFG%. They are average at taking care of the ball and don't do much on the offensive boards. They do get to the line a good amount--5th in the MAC--and 5th in making them. You can see where there are splits between BG's defense and their offense. That's where the challenges will come. Miami simply does not defend the shot well. They are 11th in overall FG% and 10th in 3FG%. That leaves them last in the MAC in effective FG% and 339th in the country. Everything else is pretty normal, except for FTs. They give up a bunch of FTs, but are playing against a BG team that does not get to the line that much. If you defend the shot that poorly without getting significant turnovers you are going to have a hard time defending and Miami has. Individually, they are led by Eric Washington, who might well be the top newcomer in the MAC. He is a 5'10" G who transferred from Presbyterian--moving from the Blue Hose to the Red Hawks. He is scoring 15 PPG on 51% shooting, which is really high for a guard. He also has 3.5 rebounds per game and 6.2 assists, the MAC"s leading total. He's been productive and efficient. Will Sullivan is the 2nd leading scorer with 11.3 PPG on 55% shooting overall and a ridiculous 49% from 3FG, which is 1st in the MAC, though he is only 14th in attempts. He also leads the team with 4.9 rebounds. Geovonie McKnight also scores in double figures at 11.3 PPG and 45% shooting. Their top four players in minutes are 6'3" or shorter. They have a couple big guys--one a FR and one a JUCO transfer--but neither of them is playing 20 minutes a game. For this reason, they are also a good matchup for BG. 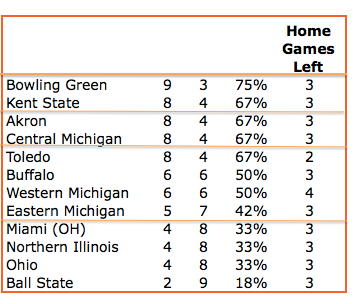 Three of the 4 lead teams in the MAC have relatively easy home games tonight and BG needs to convert this one. A loss makes winning the MAC much harder, but a win--which is what should happen--keeps the good times rolling. There you have it...BG sits atop the MAC standings with four teams sitting one game back. BG finishes with 2 against Miami, 2 against Buffalo, and Kent and Ohio. That's only one game against the teams that are competing with us...though I feel Buffalo is still dangerous. The Kent game is at the Stroh...things are stacking up for a very interesting finish. The biggest game on the schedule is Toledo @ Akron. Toledo has only 2 home games remaining and is coming off a home loss to Kent. At the same time, Akron is coming off a loss as well. Toledo really needs to pick up a win but this will be a very tough one. BG has Miami at the Stroh, Kent has Ball State at home and CMU has NIU at home...each of these teams should win and stay on the lead lap. Anything else is big news. Buffalo has a tough assignment in Ypsi...EMU beat Akron at home in the last game and the Bulls are struggling a little. Ohio is at WMU. The Bronocs finish with 4 of 6 at home, including this one and for that reason have a shot to beat out UB and UT. Richaun Holmes continues a monster senior season for the first-place Bowling Green Falcons and won the MAC East POTW award for the 4th time this season. The senior, who has already recorded his 500th career rebound and his 200th career block this year, is only a mere 41 points away from reaching 1,000 for his career. That last one is pretty significant. BG is 7.5 PPG better per game when he is in the game as opposed to when he is out. That is making a contribution. His name is Brian Ward. You can check his bio out here, but he has been a head coach and has worked on a number of successful defenses as a position coach. Then, he was DC at Drake (FCS) where the bio says he took over a strong defense and improved them in all national rankings. Ward's 2013 defense ranked seventh in the nation in total defense, while ranking third nationally in passing defense. The WIU defense also showed an incredible improvement in passing efficiency defense, tackles for loss, and sacks as Ward continued to implement his scheme during his second year. You can check the results for yourself here. They are all accurate, failing only to mention that WIU was also 52nd in rushing defense and 51st in scoring defense. The 2014 summary in the bio dwells on "unprecedented performances" against Wisconsin, Northwestern and North Dakota State. Not mentioned are national rankings, since the defense was 63rd in scoring defense, 69th in total defense, 68th in pass efficiency defense, 67th in third down conversion defense, 59th in red zone defense and 28th in rushing defense. So, maybe the Western Illinois performance is not quite as great as it sounds. It is a big hire. BG lost a lot on defense--a defense which had the nation's biggest regression under the first DC Coach Babers hired. Coach Babers says that Ward's defenses were known as "disciplined and well coached." That's the kind of thing that will be needed, especially as a lot of new players get integrated into the scheme. He does not have one down of FBS experience, which is not a disaster on its own. As for his success in FBS, that's apparently subject to some interpretation, all of which will resolve itself as he works to get results at BG. BG came into Muncie in a position that they have not been in much prior to this year...on the road against a bad team they expected to beat. Ball State had lost 9 straight coming into the game and BG just needed to finish the job and deliver #10. Which they did. The only bump in the road came when Coach Jans pulled his starters out with 6:30 left to play and BG leading by 22 points. He admitted later that was a rookie mistake. It was one thing against WMU because they had already pulled their starters, but we found that while BG's starters were 24 points better than Ball State's starters, the reserves were no match. Ball State sliced the lead to 10 in less than 4 minutes and BG had to put everybody back in to close the game out 79-65. Except for that 4 minutes, BG was in control the whole way. The Falcons led wire to wire, had an 11 point lead at the half, opened the second half with an 11-4 run to go up and 18 and the score never got closer than 10 again and was as high as 24. With Akron and Toledo losing, BG is now in an unthinkable place...unthinkable when the season started and even at Christmas. BG is in sole possession of first place with 2 home games coming next week. Enjoy it Falcon fans. We have waited a long time for this. It is not how BG is used to winning. When you see that 79-65 score, it is important to remember that the game consisted of only 61 possessions. BG had 1.3 points per possession--the second best offensive game of the season, after the South Florida win. BG shot 51% and 44%, with 12 3FG, the best shooting game of the season--and turned the ball over only 5 times, a great number even in a low possession game (in fact, tempo free the best game of the year on that measure as well. When you get shots up or fouled on 92% of your possessions and then shoot like that, you are going to be tough to beat. BG did not have its normal defensive performance. Ball State actually shot better than BG at 54% and 50%, but turned the ball over 16 times. It was better than any team has shot against BG this year. With the turnovers, BSU had 1.07 points per possession, which is the fourth worst game for BG's defense this season. Neither team did much on the offensive boards and free throws were not a factor. Both teams shot well, and BG's ability to take care of the ball was the difference. Richaun Holmes has another big game, with 20 points on 8 of 13 shooting, 7 rebounds, 4 assists and 3 blocks. Zack Denny broke out of a slump with 18 on 6 of 10 and 4 of 6 to go with 6 rebounds. Anthony Henderson had 11 points on 4 of 7 shooting. Pep Joseph had 4 assists and 1 turnover in 25 minutes. And the beat goes on. The first place Falcons now host Miami and Buffalo this week. 7 games remain in the MAC schedule. What will be will be...BG has tie breaker issues with Akron and with UT--but the Falcons are showing themselves every week to have a legitimate shot at making a run in Cleveland and--if they can beat Akron and UT--to have a shot to break back into the Big Dance. I remember once BG played Miami at Anderson and BG was in the midst of a long losing streak. This was the Cole Magner game. Charlie Coles said that you didn't want to play a team on a long losing streak on the road because they will "do anything" to win. BG travels to Muncie to play Ball State. The Cardinals are in a bad, bad way. After winning their first two MAC games, they have now lost 9 straight to sink to the bottom of the MAC. They haven't had any major injuries, they are just in a really bad way. Within the 9 games, there have not really been any real close calls, and four of the losses have been at home. Ball State is an average offensive team. They are 8th in offensive efficiency, with strong 3 point shooting but worst in the MAC turnovers. They are average at offensive rebounds and 10th at getting to the line and 10th in FT%. Given BG's success in holding teams below their offensive average, I'd like to think something similar could happen here. Meanwhile, they are the 10th defensive team in the MAC. They are 11th in opponent effective FG%, don't force many turnovers and are 10th in allowing free throws. This is just a last place team with last place stats. 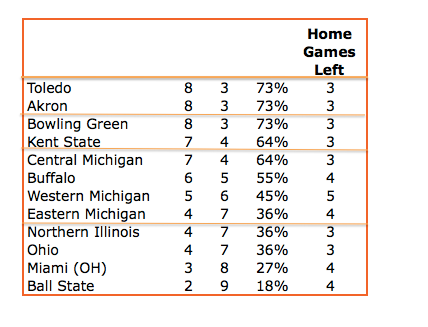 It is worth noting that Ball State is the youngest mean in the MAC and one of the 30 youngest teams in D1. You'd expect that team to struggle. BG played Ball State at the Stroh earlier this year. The game was close until about 13 minutes left, when it was tied at 33. From there BG went on a 10-0 to assert control and that led to a 25-13 run to put Ball State away. Statistically, BG held Ball State .77 points per possession and scored .97. BG did not shoot well that day at all, but Ball State was just as bad and also turned the ball over a little more. The key to the game was free throws. Ball State got to the line 13 times and made only 5 while BG got to the line 26 times and made 19. Zack Denny double-doubled at 17 and 10. Parker had 11. Holmes had a rough 11 on 3 of 8 shooting and 7 rebounds. Zavier Turner was the only double figure scorer for Ball State at 14 ponts. That's the status. BG needs to do what everyone else has done against Ball State...you just worry that this is when they bring it together enough to win. No one loses forever. They will be desperate to get a win and they are at home. My guess is that if BG wins, this one will come with a pretty good struggle. So here are the MAC standings current for today. These are tie-breaker correct, so that's a true look at how things are today. There are now 5 teams within one game of the lead, which leaves one of those teams out of the bye-range. The Falcons are in 3rd due to their losses to UT and Akron. They have a one-game lead--plus a tie-breaker (right now) over both Kent and CMU. BG had a 3-game lead for home court with 7 to play. Tonight's Friday night special. This is a big one. Kent is coming off a loss against Akron, and UT seems to be hitting their stride after a big win @UB. It will be interesting to see if UT is starting to regain its home court mojo. I like UT in this one. More tomorrow, but BG really needs to win against the MAC"s last place team, even on the road. Saturday's biggest game. CMU is looking to be the real deal but UB is under some real pressure. They are now down two games from the top of the conference and their Coach (as always) seems more interested in refereeing than he does in Coaching. Anyway, I look for UB to close this one out, but the pressure will be on for this one. The Bulls don't want to go down 3 with 6 to play. Akron should win this one...EMU is paying the price for their soft pre-season schedule. 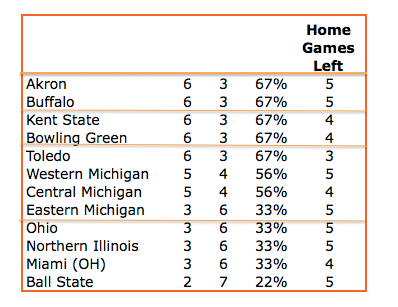 After the meltdown at the Stroh Wednesday, look for WMU to rebound in front of home cooking. No actual standings consequences to this one. Coach Jans said after last night's game that BG got what it needed, which was a game that didn't come down to the last seconds in a nailbiter. It was, in fact, that and more as BG beat WMU 65-49 in a game that wasn't actually that close. "Regardless of the circumstances - not having Austin and the flu bug or whatever the case is - it doesn't excuse what took place tonight for the guys in a Western Michigan basketball uniforms. I told them afterwards that every player that's ever played for us would have been embarrassed to see what took place tonight. There's no excuse for it." WMU has certainly struggled without Richie. His loss coincides directly with the losing skid WMU is on. Once he gets back, I'd consider them a team I would worry about facing in the tournament. Still, there was a lot of good about BG's performance. The biggest thing was how effectively BG defended. WMU had a season-low point total. In fact, their .74 points per possession allowed is the second best of the year for the BG defense, eclipsed only by Chicago State. Also, it is .32 below WMU's MAC average...a 30% reduction. Some of that was on turnovers that could be PG related--WMU turned the ball over on 25% of its possessions--but most of it was a team that is used to shooting 46% and 37% and holding them to 34% and 20%. 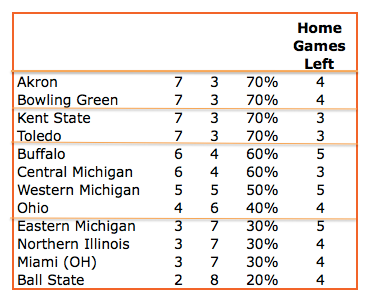 WMU was one of the 3 top shooting teams in the MAC, and BG completely defended that at the Stroh last night. BG also held WMU off the boards. Even at the line, where WMU was able to get 19 FTs to BG's 8, they shot very poorly, made only 11 for a net +6 advantage at the line. 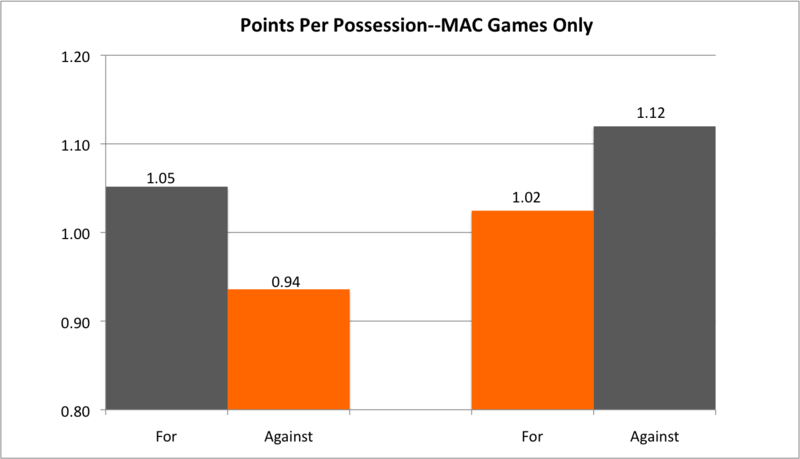 BG had .99 points per possession, which is about its average in MAC play. BG shot 44% overall, but the key to the game was that BG also shot 44% from 3FG. Hard to lose that way. BG did turn the ball over too much (22%) in something that is a little bit of an emerging issue. BG didn't have a great day on the offensive boards, but the shooting was enough to win, especially when the defense was as effective as it was. Spencer Parker had his 2nd great game since being taken out of the starting lineup. He had 19 points on 7 of 10 shooting and he made all 5 of his 3FGs. All of that production came in 23 minutes. Anthony Henderson also continues to have a hot hand, scoring 15 of 6/9 and 3/5 shooting to go with 5 rebounds and 3 steals. Holmes had 12 points on 5 of 8 shooting with 6 boards and 4 blocks. Denny had 6 on 3 of 6 shooting--to his credit, he doesn't force shots up and hurt the team. Clarke and Joseph continued to struggle with their shots. Importantly, BG really worked David Brown. He had 9 points on 3 of 12 and 1 of 8 shooting. BG is now 8-3 in MAC play and remains in a tie for first with Akron and UT. Since BG has lost to both of those teams (all 3 of its MAC losses, in fact), BG is in 3rd. Obviously, you have to feel good about the season to date and to even be having a conversation about BG earning one of the 4 byes would have been unthinkable a year ago. One last disappointment was the very small crowd...1,474. That's disappointing for this team coming off 2 road wins. I know we had a big crowd for Akron--and lost--which has been a move we have tended to make over the years...but we have typically drawn in the low 2s and it was disappointing to see us even below that. Last year's MAC Champs...the WMU Broncos...head into the Stroh. They are a couple games out of first and BG is tied for first, but with 8 games left in MAC play a lot can happen. BG has won the last 3 in the series...WMU won the four before that. BG's win @WMU last year was one of the season's highlights. WMU is 14-9 and 5-5 in MAC play. They are not playing well. They have lost 4 of the last 5 (all without Austin Richie), though they lost @Akron and @CMU...and at home to Buffalo. They lost @EMU--probably one they'd like back--but they did beat Kent in KZoo. They are 2-4 in MAC play on the road. WMU is on the high offense low defense model. They are scoring 1.06 points per possession, which is 5th in the MAC. On the other hand, they are allowing 1.08, which is the 10th worst defense in the MAC. One of the things that should make the game interesting is that there are good spreads between the two teams....WMU is used to scoring more than BG allows and allowing more than BG scores. So what makes WMU good at scoring? Well, they are good at shooting it and taking care of it. They are 3rd in the MAC in FG% and 2nd in 3FG%. They don't take a ton of treys but they are effective when they do. They are 3rd in the MAC in not turning the ball over. That's a pretty good combination. Unlike past Bronco teams, they are not great on the offensive boards and just average getting to the line. Also, they only shoot 67% from the line. On the other side, we can see that WMU and BG are pretty evenly matched on the stats, which is weird since the shooting numbers are so similar. They don't force many turnovers at all and while they don't give up that many free throws, their opponents are shooting FTs very effectively against them, which costs them points even if there isn't anything they can do about it. They are led by David Brown, who is in his 11th year of collegiate competition. He is scoring 18.5 PPG in MAC play. He's not efficient.....shooting 42% and 36%. Dude is a 3-bomber man, leading the MAC in attempts and made. Connor Tava is scoring 12.5 PPG on 50% and a team-high 6.8 RPG and also a team high 4 assists. 6'6" SO Tucker Haymond is scoring 12.6 on 48% shooting. They have been playing without injured Austin Richie for 5 games and he is scoring 12.8 PPG. Last I saw he was day-to-day. Drake LaMont, a 6'10" freshman gets 5.5 RPG. WMU is always dangerous. This is a game BG should be able to win, but WMU has good size and inside guys and therefore presents a challenge for BG. Expect Josh Gomez to continue to get minutes. In a tight race, you gotta hold serve at home and that's the Falcon challenge. So, MAC games are on Tuesday this week....here are the standings. Again, no tie breakers have been employed, just sorted by remaining home games. With half the conference within one game of the top, we are buckled in for some high quality play. Two very big games tonight. First, Kent is at Akron. Game often ends up being big, and this year is no exception. Akron beat UB at the JAR last week and they are a 6-point favorite tonight, given that Kent is without Jimmy Hall, Kellon Thomas and maybe Kris Brewer. Second is Toledo @ Buffalo. The Bulls need this one pretty badly. With a loss, they fall 2 games behind at least the winner of Akron and Kent. Pressure is on Toledo, too. The Rockets are playing much better but have 5 road games left and a win here would be huge. BG plays WMU at the Stroh. CMU@OU should be interesting. The Bobcats seem to be playing better and they are at home, but CMU appears to be pretty good. 10 games into the MAC season, this statement is still true: the Bowling Green Falcons are in first place, tied with 3 other team at 7-3. This is also true: last year, BG won 6 games in MAC play. The 7th win came in DeKalb, and it certainly did not come without struggle. BG has been getting and conceding big second half leads lately, but for the second straight game made the plays it needed in the final minute to put away the win. The Falcons won two road games in the week. The beginning of the game could not have been worse. BG opened in a man-man, as they normally do, and (in Chris Jans' words), NIU "shredded" it. with 8 minutes gone in the game, NIU had 18 points. Meanwhile, BG's offense was dreadful, and the Falcons had only 4. So, at that point, things are not looking so good. Jans switched the Falcons to a zone defense and then the Falcons got to work on cutting the deficit. Which they did. With 3 minutes left in the half it was down to 9 and then BG went on a 9-0 run to have the game tied with about :30 left. NIU got a late 3 and led by 3 at the half, but I think it was important that BG had the game tied that late. That's a nice comeback and you have done from playing your worst basketball in quite a while to being right back in the game. BG came out of the second half smoking, blasting an 8-0 run to take the lead for the first time. The Falcons kept the pressure on, and with 8 minutes left in the half stretched the lead to 51-41. At that point, the second half score was 23-10 in BG's favor. (Remember, NIU had 18 points in the game's first 8 minutes). The lead got as high as 13 with 7 minutes left. NIU battled back, but BG still led by 8 with 3 minutes left. The score at that point was 63-55, and you'd have to feel like you were in pretty good position. Unfortunately, BG would not score again until :19 were left, and NIU went on a 7-0 run. They never tied it, but with :47 left they had the lead down to 1 and BG had the ball. With :38 BG called time and then with :19 left Jehvon Clarke made a mid-range jumper (for the second game in a row) when the team really, really needed a basket. BG up 3, NIU came down and got a dunk that was way too easy and BG was up 1 again with :11 left. NIU latched big time pressure on BG on the inbound (they have seen game film) and BG got the ball to Henderson who was fouled. There was :06 left. Henderson made both FTs and BG was up 3 again. After a timeout, BG elected to foul NIU before they could launch a 3. That's the right move and I don't understand why more teams don't do it. Or all teams. If a 3FG is a low percentage shot, the only lower one is trying to miss a FT on purpose and get the rebound. As it happened, it almost worked out...NIU made the first, missed the second and then Richaun Holmes very nearly put it back in the cylinder, but he was able to end up with the rebound. He converted his 2 FTs and that was the game. Note: It was a homecoming for Holmes who playing near his hometown and he had a bunch of fans in attendance. There were also some of the Jans family from Iowa in attendance. It was actually a day when neither team played effective defense. The score totals were not that high, but the game had only 63 possessions as well. BG scored 1.09 points per possession and NIU had 1.03. BG typically holds opponents to .93 and that's the 6th worst defensive performance of the year. BG shot 49% and 29% for the game while NIU had 38% and 41%. Not often you see a team shoot better from 3FG than from 2FG, but NIU shot only 36% on 2FGs against 68% for BG. How did the game get so close? The key factor was offensive rebounds. BG contained this in the first matchup but NIU crashed the boards effectively. NIU also had +2 advantage in FTs, though BG did shoot 74%. Richaun Holmes had a big night for the home folks. He scored 18 on 7 of 11 shooting, had 2 3FGs, 8 rebounds and 4 blocks. Jehvon Clarke had a nice night too and has to be in the running for best 6th man in the MAC. He scored 18 on 6 of 10 shooting, making all 4 of his 2FGs and added 4 assists. Spencer Parker came off the bench for the first time and he seemed to respond, scoring 16 on 6 of 9 shooting and 4 rebounds, including vital scoring as BG got back in the game in the first half. Beyond Clarke, BG's guards are continuing to struggle to shoot. Austin did have 4 assists (and 4 turnovers) and Denny had 6 rebounds. Coach is talking about playing more guys. Gomez got into the game and contributed 5 solid minutes. He also talked about playing Tisdale, but JD remains under the weather. The Falcons now have a home against WMU and travel to Ball State on Saturday. WMU will be a good test for the Falcons as they play the physical style that has given the Falcons trouble. Still, we are at a place in the program where you can think that BG has a good shot at winning them both. Coming off the big road win in Mt. Pleasant Wednesday, BG now heads from the far north of the MAC to the far west. Lotta bus time this week for the boys. DeKalb, Illinois and NIU is next. NIU is 9-11 and 3-6 in the MAC. They have won @OU, at home against Akron (which BG did not) and @Miami in their last game out. They have lost at home to Kent, Miami and UT, and on the road to Buffalo, EMU and BG. We just played this guys a couple weeks ago. They are a big, physical basketball team that excels in getting offensive rebounds and getting to the FT line. They played BG very tough at the Stroh, leading with about 8 minutes left before BG went on a big run and won the game by 10. BG took NIU out of their game. The Huskies, who came into the game averaging 38% of available offensive rebounds, were held to 29%. NIU did get to the line 14 times, which was just a little bit below their average. Meanwhile, BG completely locked them down on defense, allowing only .8 points per possession on 38% and 17% shooting...but the key was getting them to miss shots and then keeping them off the offensive boards. It was BG's fourth best defensive game of the season. BG had a decent offensive game. They scored .98 points per possession on 43% and 39% shooting. That indicates just what you would think, that it is tougher going inside against this very physical team, but that BG was able to make 7 3FGs and that was enough to win the game. The Falcons won despite poor FT shooting (7 of 13)...they were in a little slump right then which they seem to be out of now. Richaun Holmes had a big game. He scored 18 on 8 of 14 shooting with 7 rebounds. Denny scored 13 on 5 of 7 shooting and Anthony Henderson scored 11 points. Delvin Dickerson had 8 points off the bench, including 2 3FGs in BG's decisive second half run. Hopefully, BG is getting back to good health after a bug has been running through the team. Another key is that BG needs to keep Holmes and Dickerson out of foul trouble. BG is thin inside, and BG needs both those guys available. Beyond that, the keys to the game are the same as before: force misses, convert the rebound and then make enough shots to win the game. And here you have the MAC standings heading into tonight's games. Jeremy Guy at the MAC has this all sorted out for tie breakers, for now I'm just using home games left as a tie breaker. Once it gets a little farther along and things shake out a little, we can start to use tiebreakers. Anyway, this is a very interesting MAC season. There are 5 teams at 6-3--at least one of these teams won't get a bye. And then there are two other teams that are 1 game back, so that's 7 teams within one game of the lead. The one in the most trouble is UT, which plays at home only 3 times in the final 9. BG is at NIU...a team they beat by 10 at the Stroh, but at home. (And a big, physical team that could give BG trouble). EMU is at OU. Neither team is a contender right now. WMU at CMU. Rivalry game, should be a donnybrook, plus they are tied at 5-4. UT at BSU. Rockets might be hitting their stride. BSU is in last place, but game is on road. Look for Rockets to close door on this win. Miami at Kent. Flashes playing without Jimmy Hall, but should hold serve at home. Buffalo at Akron. Marquee game of the day. Akron coming off a loss, Buffalo might be best team in MAC. But can they win at the JAR. The big challenge for BG was to stop the CMU offense. 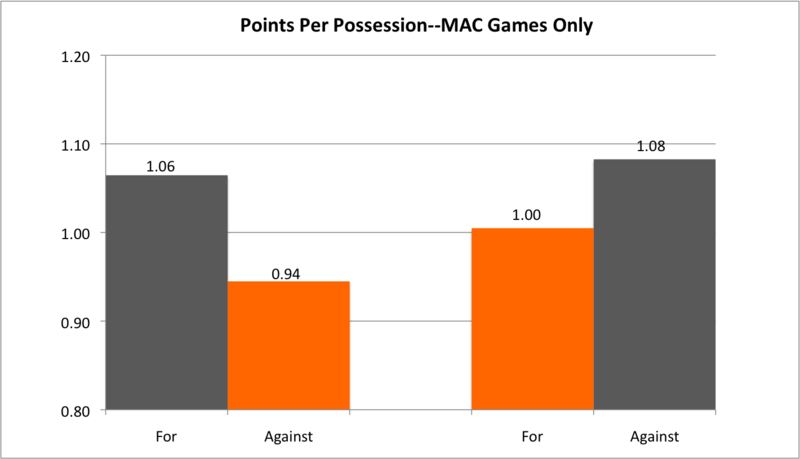 The Chips had the best shooting offense in the MAC and was scoring at a highly efficient rate. It was billed as the best offense against the best defense....and how did it play out. This is actually a really interesting chart. BG shot the ball really well. I'm talking really well. BG shot 53% and 42% for an effective FG% of 60%, which was their second best shooting game of the season. So...that was BG exploiting a not-great CMU defense. Meanwhile BG held CMU to 40.9% and 20%. That is an effective FG% of 45.5%, which was their fourth worst of the season. You would not expect a game with that kind of a shooting disparity to be even close. 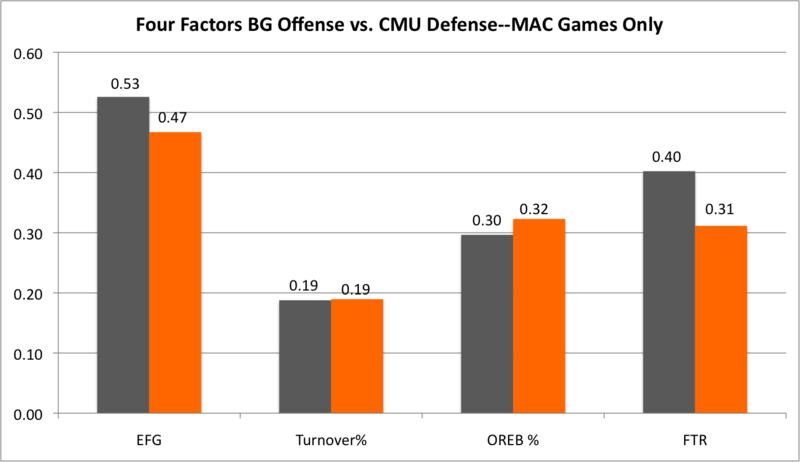 BG frittered away ALMOST all of that shooting advantage by turning the ball over about 3 times in every 10 possessions, which is their worst game of the year, while CMU took better if not great care of the ball. For the second straight game, BG struggled mightily against full court pressure. It was bad. Might be the one part of the team that is not improved over last year. They are going to need to figure it out, because I suspect BG will see more of it until they do. At one point, BG even tried to go over the top on a baseball pass, in both cases throwing the ball away and one time getting it brought all the way back down the floor. 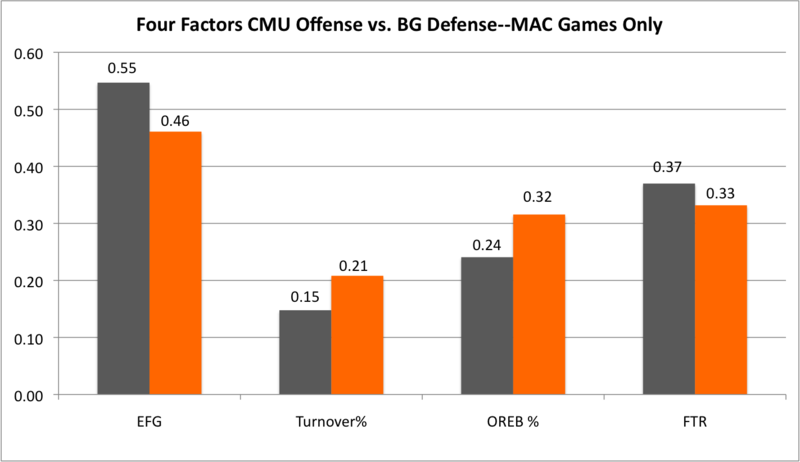 CMU also had a good day on the offensive boards while BG had its second worst game in that respect as well. I don't know if BG was falling back to protect against the break or if they just weren't getting the boards, but that is a really low number. 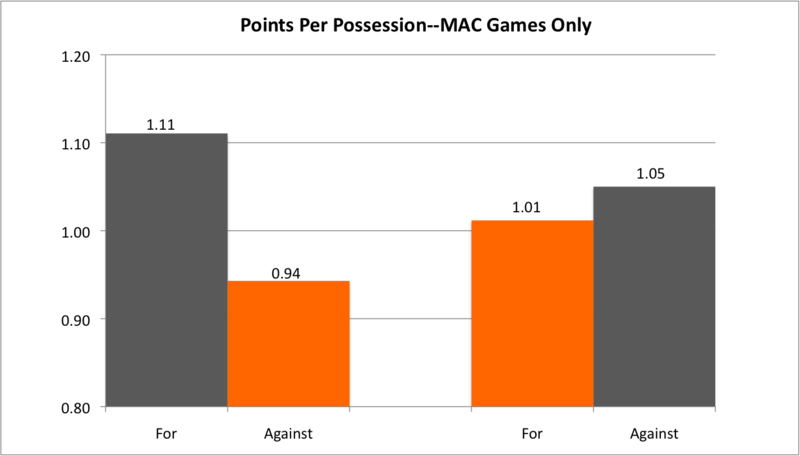 Overall, BG had .97 points per possession, which is a tick below the average, whereas CMU scored .95 points per possession which is well below that 1.11 per MAC possession. Here's the key...they tried 30 threes--the second most for them in a MAC game--and they made 6. That's right...6. Hard to win that way. Individually, the story of the game was Chris Fowler, who was unconscious. He scored 42 in 42 minutes, playing most of the second half with 4 fouls. He shot 14 of 23, 2 of 6 from 3FG and 12 of 17 from the line. DUDE shot 17 FTs. It was a dominant offensive night where he scored 57% of his team's points. He had only 2 assists, mostly on account of, oh yeah, 23 shots. John Simons scored only 10 on 3 of 6 shooting and 7 rebounds. Other shooters like Rayson, Simmons, Kozinski and Hibbits struggled to get their shots down. For BG, 5 players were in double figures. Anthony Henderson had 20 points...20 senior-led, leadership points, with 8 of 12 shooting and 4 of 7 3FG. He also had 5 rebounds and 3 assists. Jehvon Clarke had 18 points on 6 of 11 shooting, 2 of 3 from 3FG and 4 steals. Denny had 12 points...4 of 6 and 1 of 2 shooting and 3 of 4 from the line, including the game clinchers. He also had 7 rebounds. Holmes had 10--but on 4 of 5 shooting--with 7 rebounds and Dickerson scored 10 on 4 of 9 shooting with 5 rebounds. At PG, Joseph went almost the whole way, playing 37 minutes as compared to 9 for Austin. Jovon had 4 turnovers in those 9 minutes. Falcon Men Deliver in Final Minute, beat Chips. Big win last night for BG Men's basketball. On the road against a team that had yet to lose at home, flu winding through the team, coming off a heart breaking loss, and then delivering the road win. It was a very good win for the team...and how it happened is just as important as what happened. The thing started in a bad way. Again, coming off the big loss, flu bug running through the team, and then 10 minutes into the game CMU had an 11 point lead. You could have reasonably feared that this would be like the first game at Akron, where it starts like that and just balloons out to a lost night. It did not. BG scored the next 7 and had the lead back to 4 and an overall 17-6 run had the game tied with about 90 seconds left. CMU got a late hoop to head into the locker room up 2, but BG had taken the first punch and was still standing. Then BG delivered a punch of its own. In about 3:30 BG went on a 12-1 to open up a 9 point lead. From there BG held the line for almost the whole way, punching the lead as high as 10 and as close as 3. With about 2 minutes left, BG was up 5. Chris Fowler nailed a 3, BG turned it over twice (bringing back memories of the Akron game) before Fowler scored again on a lay to tie the game with 1:30 left. That's a second punch from the Chips. Crowd gets in the game, big push, lead evaporated, tired team on the road with the flu...you are standing right on the edge of the cliff. BG had the ball and Holmes was called for a charge on a really nice play by Fowler--technically that's 3 turnovers in about 60 seconds--and BG got one miss, failed to control the offensive board (hello Akron) and the Chips capitalized with a Fowler jumper to go up 2 with :34 left. And here is where things changed. BG came down, Clarke missed a shot and Holmes grabbed the offensive board while John Simon was using a move he borrowed from pro wrestling. Holmes had 2 shots and he calmly stroked them both to tie the game back up. CMU still had :12 left and Fowler did what he did all night, which was torch the BG defense (more later) but this time he dished the ball to a wide open Austin Stewart. Richaun Holmes made what was probably the play of the game...spanning from help defense on Fowler to elevate on Stewart at a very high point and block the shot to preserve the tie. That kind of agility and the ability to elevate that quickly is just remarkable athleticism. So, OT. On the road, flu ridden team. Anthony Henderson drilled a 3 to start it off and BG got a stop and had a chance to take a two score lead. Instead, BG turned the ball over. From there, the game was either tied of a BG lead until 1:30 was left, when Chris Fowler (again) drilled a 3 to put CMU up 1. Henderson responded with his own 3 and BG had the lead by 2. Fowler nailed 2 FTs to tie it back up with :55 left. Jehvon Clarke hit a 2FG jumper to put BG up 2 with :43 left. On the other end, Fowler (who else) took a 3FG and missed (WOW) and then Simon had the offensive board (seem familiar) except Pep Joseph stole it from him, in what was probably the second play of the game. It wasn't over yet. Dickerson was fouled and missed both FTs, so CMU was still down only 2. This time Kozinski took a relatively low percentage 3FG with :10 left, this time BG cleared the board (Zack Denny) who was fouled, nailed both FTs and BG had secured the win. I'll look more on how this all happened later, but in the meantime, it was a big win for BG in a game that they had opportunities to lose in the last minutes. As a contrast to the Akron game, this time they made enough plays to win...it was a gutsy win for our guys and they deserve to be proud of it. They have not lost 2 straight all season, which to me is the sign of a good team. Above is the official recruiting highlight video for BGSU football today. You can find the full release with extensive player bios here. OK, so just checking in mid-day on the NSD festivities. BG has an NLI from 21 players and says the class is complete. Justice Hart from Glenville who committed in June is going the JUCO route. Ryon Lucas, who we mentioned last night is most likely a preferred walk-on, though there is a picture of him "signing" with BG on twitter. 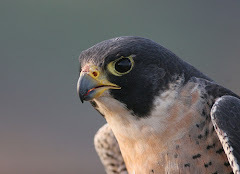 The recruiting news starts at 1 on bgsufalcons.com with Coach's presser at 2. Updates will also be provided on Twitter at Twitter.com/BG_Footballand fans will be able to ask the coaches questions during a Twitter Takeover during the morning. Use the hashtag #BG15NSD to join the conversation. So tomorrow is the day...all will be revealed. Two more verbals coming on board tonight. Watch carefully tomorrow until all the names come in. Some of BG's recruits are under significant pressure from other programs. The first is Ryon Lucas of Trotwood-Madison. He played both ways in HS, seemed to get more of his props as a WR. Trotwood-Madison is a DIII power in Ohio and Lucas played in two state title games, including last year, losing to Toledo Central Catholic. This is the same HS that Ferrod Gardner attended. Gardner was a BG commit who de-committed and today made a verbal to Missouri. Lucas was productive HS receiver...in fact, was 6th in his conference with 32 receptions at 19.7 YPC and 9 TDs. He was all-GWOC North. He is 6'0" and 157, which is light. It is not clear whether he would play WR or DB at BGSU. The other verbal is Kyle Junior. His dad was EJ Junior from Alabama fame, and he went to HS in Middletown, a longtime source of players for BG. Kyle had offers from UC, Ball State, WMU and BG. He is a DE with 53 tackles, six tackles for loss, two forced fumbles, two fumble recoveries (one for a 78-yard touchdown) and three sacks this season. He was all-district special mention and all-conference. He is 6'3" and 245, and might fill the spot opened with Rahn Bailey left to attend the Naval Academy. Welcome to the Falcons, Ryon and Kyle. So, off a loss, BG heads to the road for 2 straight. This is clearly a challenging time on the schedule. To add to it, they are playing another surprise team, the CMU Chippewas. They are 15-4, with 3 non D1 wins and 5-3 in the MAC. They are 4-0 at home, with wins over Miami, Buffalo, EMU and Ohio, and a road win over UT. They have also lost @Akron, @Kent and @Ball State. With BG and WMU at home over the next 2 games, they are facing an important part of their schedule as well. They are the best offensive team in the MAC. They are scoring 1.11 point per possession in MAC play. They are at only 65 possessions, which is somewhere in the middle of the pack of the MAC, so it isn't on high octane. They are 8th in defensive efficiency. Therefore, as you can see below, we have a contrast of two styles. BG is a defensively-oriented team and CMU is an offensively-oriented team. As those styles clash, we will see who prevails. CMU combines a potent mix in achieving that offensive efficiency: they are very effective shooting the ball and they rarely turn it over. They are 2nd in the MAC in FG%, 1st in 3FG and 1st in 3FG%. That's potent, but they also first in not turning the ball over. So, bunches of shots and they are good at making them. They are last in offensive rebounding and in the middle pack at getting to the line, but those can't ruin the shooting and ball possession they have. This will be a huge challenge for the BG defense. Teams are rarely good on both sides of the court, and CMU is not either. They are 10th in allowing FG% and 10th in 3FG% and they are second to last in allowing teams to shoot against them. They don't force a ton of turnovers, are not great on the offensive boards and allow a good amount of free throws. The question here is how well the Falcons do at taking advantage of these weaknesses. BG is clearly not a high octane offensive squad and even with CMU's soft defense, the Falcons need to be ready to take advantage. Some shooting from the guard position surely would help. Individually, they are led by Chris Fowler, the JR PG who is the best player no one has heard of. He's scoring 14.4 per game on 52% and 37% shooting, very good numbers for a guard. He also has 6.1 assists per game (2nd in MAC) over 2.3 turnovers. John Simons (6'8") is scoring 11.5 on 51% and 45% which makes him the 5th best shooter in the MAC. He also leads the team with 6.2 RPG. Braylon Rayson, a 5'9" SO G is scoring 10.4 PPG in only 21 minutes. He's a little less efficent, at 42% and 36%. Josh Kozinski is also a dangerous 3FG shooter. This should be a very interesting game. BG is going to need to guard very, very well, especially against Simon, who might be the MAC's best inside-out threat. This will be a clash of styles, with CMU clearly favored on home court, where they have won all their MAC games. On the plus side, BG has responded very well to losing during the Jans "era" so perhaps that can happen again. My fear is that BG is running out of gas a little--something we have seen from our teams in past years. They are running a much shorter bench, and just seem to be losing a little zip. One last important factor. BG needs Dickerson and Holmes to avoid foul trouble. CMU is much less of an inside team (compared to Akron, for example) so maybe that can be done.